Discussions on the fate of discarded electrical and electronic devices (DEEDs, aka “e-waste”) and the configuration of the recycling sector in the Global South are riddled with the adjectives “formal” and “informal”. Scientists, engineers, corporate representatives, government officials, environmental activists and journalists make this distinction to categorize economic actors, often in ways that convey the impression there are two distinct, well delineated camps. There’s no doubt that the “formal” vs “informal” dichotomy oversimplifies reality. In practice, one finds it difficult, if not impossible, to identify a clear-cut boundary within any country’s recycling sector. But, flawed as it is as an analytical tool, this dichotomy seems to do a fine job for a great number of people. Such a paradox requires further investigation. How to account for its success? Why do people use it? How does it shape the world? 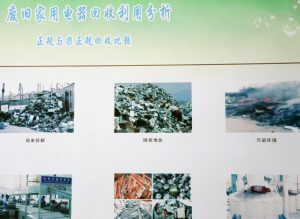 Below, I approach these questions by looking at the evolution of DEEDs recycling in mainland China. A mere decade ago, only a handful of countries had regulated DEEDs recycling and most of them belonged to the so-called “developed” world. China was among the first “developing” or “emerging” countries to follow suit. A common trait among those countries is that activities such as collection, repair, dismantling, pre-processing, aggregation, transport and resale were undertaken chiefly by small but well networked entities. The sector was composed of self-employed people, family businesses and small enterprises, all of which relied heavily on manual labor as well as on solidarity based on kinship or laoxiang (place of origin) ties. To a large extent, this still holds true in today’s China. 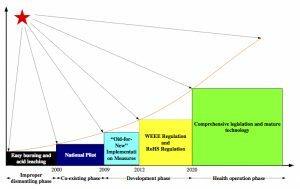 But a turning point was reached in the mid-2000s, when the central government started crafting regulations and policies that favor a different type of economic entities, namely corporations capable of operating capital- and energy-intensive recycling plants. 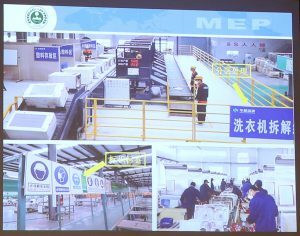 Calls by a number of academics to integrate some of the existing businesses into the new “formal system” (zhenggui zhidu) went unheard. As this system progressively took shape, it became clear that the small guys would be left out. Among them, some, like collectors, still enjoy room for maneuver, thanks largely to their unmatched efficiency. But even they were not invited to participate in China’s transformation into a “circular economy” and an “ecological civilization”. 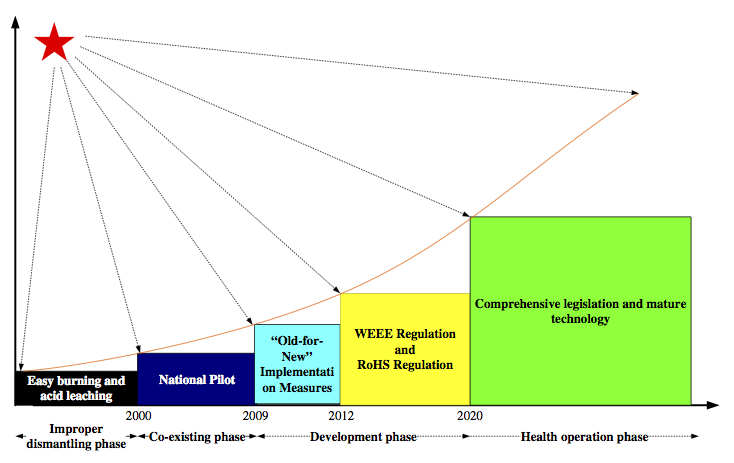 Diagram entitled “E-waste management in China: from past to the future” (sic) published by Chinese academics. Image courtesy Zeng Xianlai et al. When meeting in specialized conferences in China, institutional experts chant the mantra of environmental protection. “Primitive” recycling operations generate a great deal of pollution, they claim, whereas “advanced” ones manage to control this pollution and at the same time extract more value out of DEEDs. Hence the necessity to replace “small workshops” (xiao zuofang) and their owners with large industrial plants and proper “companies” (gongsi). Images of contaminated lands populated by destitute people — a dominant trope in representations of “e-waste” (dianzi laji) — usually drive the point home, especially when displayed in conjunction with architectural models of clean and automated premises. Pollution arising from DEEDs processing is an undeniable fact. But comparisons between the “formal” and the “informal” sectors (or systems) are biased and highlight only one aspect of the problem, namely end-of-pipe pollution. More importantly, the apparent centrality of pollution prevention as rationale for revolutionizing the recycling sector diverts our attention away from other factors that arguably better account for this change. Below, I focus on four of them. First, institutional experts consider it necessary to “systemize” (zhiduhua) the current recycling sector, i.e. assemble its elements into an organized whole. Alas, some of these elements fit better together than others. An engineer with whom I was discussing the work of independent collectors in China agreed that these people were extremely efficient and useful. However, he felt simultaneously that they should be replaced, because “they are hard to manage”. As I see it, his claim was that independent collectors operate under rules and practices that are too different from those of Chinese state authorities. Here, the problem is incompatibility, not incompetence — and obviously the State’s operational modes are not questioned. 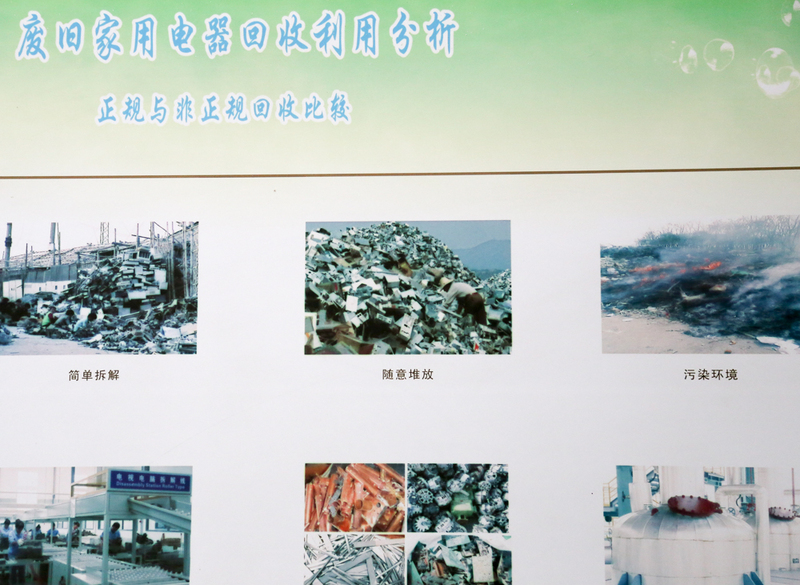 The expression “guerilla groups” (youji dui), commonly used by institutional experts, also reveals how small recycling businesses’ mobility and adaptability troubles them. “Systemization” overlaps partly with “formalization” proper or “regularization” (zhengguihua). Experts lay great emphasis on regulations, authorizations and certifications and many of them consider compliance to this set of rules necessary and sufficient: it obviates the need for further inquiry. Conversely, non-compliance disqualifies entities almost automatically. This, in turn, brings us to “standardization” (biaozhunhua). Institutional experts stress that, despite recent progress, China still lags behind “the rest of the world” (guowai) — read “developed countries” — and should strive to reach “international standards”. They keep track of technical developments in countries like Japan or Germany and call for similar solutions to be implemented in China. In every area of interest for recycling (e.g. processing, management, administration), techniques from abroad enjoy a positive aura as tokens of progress. They prove — be it only symbolically — that China has caught up with older industrial powers. “Industrialization” (chanyehua). Entities and techniques that do not qualify as “industrial” are not considered as potential elements of the new system and ignored. A Chinese researcher explained to me: “you just don’t get any funds for that kind of research.” In extreme cases, this trend leads to denial: several foreign experts reported having heard Chinese colleagues claim that China has no informal sector. Experts also advocate “scaling up” (guimohua) the industry, which means increasing volumes of treated DEEDs as well as companies’ average size. The central government seeks to reorganize DEEDs recycling by keeping only large entities, which are easier to monitor and control. What is at stake in discourses on (in)formality in the Chinese recycling industry are dynamics of in- and exclusion. Large entities are deemed worthy protagonists in China’s development, whereas small ones are not. Contrary to what is routinely claimed, this has little to do with their respective environmental performances and much more with what progress means and who spearheads it in present-day China. This is the second short piece in a series of five which are focused on the generativity of waste and its various modalities of power in contemporary China and Taiwan. The series provides a follow-up to the panel “Living through Waste and Waste as Lively” presented November 21, 2015 at the 114th American Anthropological Association Annual Meeting in Denver, Colorado. Yvan Schulz is a PhD candidate in anthropology at the University of Neuchâtel. He explores the so-called “afterlife” of discarded electrical and electronic devices in Guangdong Province and other ares of China. His research is supported by a grant from the Swiss National Science Foundation.